Émile Betsellère (1847–1880), L'Oublié! (Forgotten) (1872), oil on canvas, dimensions not known, Musée Bonnat-Helleu, Bayonne, France. Wikimedia Commons. 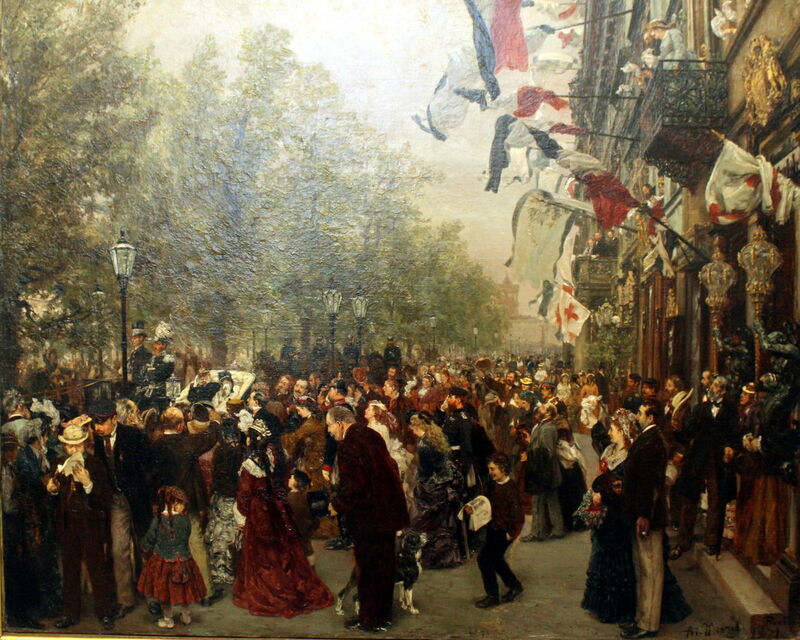 Painting in Europe during the latter half of the nineteenth century was centred on Paris. A lot happened in other countries too – the Pre-Raphaelites for one – but the major movements of the time all came together in the capital city of France. Yet in the middle of this, from 1870-71, there was a major war in northern France between two of the great empires of the day, France and Prussia. Paris was put under siege, fell to Prussian occupation, and was then torn apart by the Commune. These events had great impact on art and artists at the time. Some fled for safe places: several went to London, which exposed them to important influences such as the paintings of Turner and Constable, who were formative to the Impressionists. Some died during that war, and promising and very influential careers were terminated abruptly. Many stayed, and witnessed the horrors of war at first hand. 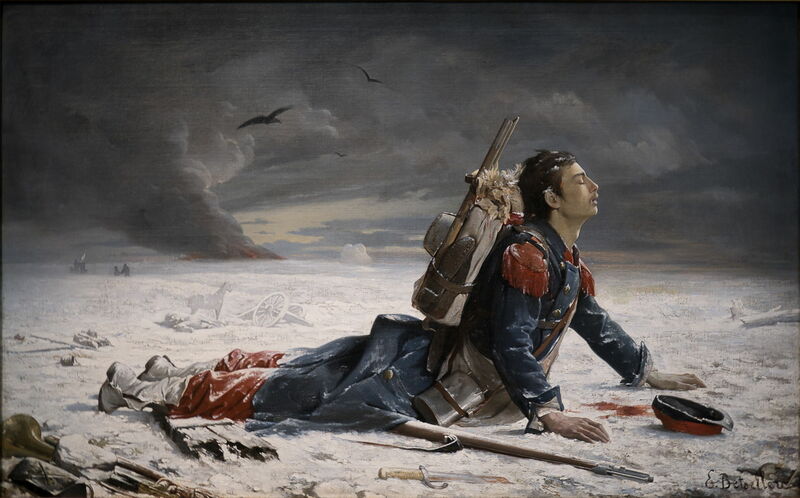 In this series of three articles, I look at the Franco-Prussian War, its aftermath, and some of its effects on art and artists. Like so many wars, the Franco-Prussian War arose because of ambitions by both countries which were in conflict. The French Second Empire under Napoleon III had been in decline for several years, and had already demanded Belgium, Luxembourg, and the left bank of the Rhine in ‘compensation’ for Prussia’s annexation of territories to form the North German Confederation. Prussia was clearly seeking to become the dominant power in Europe, by forming a single nation from those previously separate states, plus the Southern German States and the French territory of Alsace-Lorraine. France and Prussia were on a collision course, and on 19 July 1870 France declared war on the North German Confederation – a war for which it was almost completely unprepared. 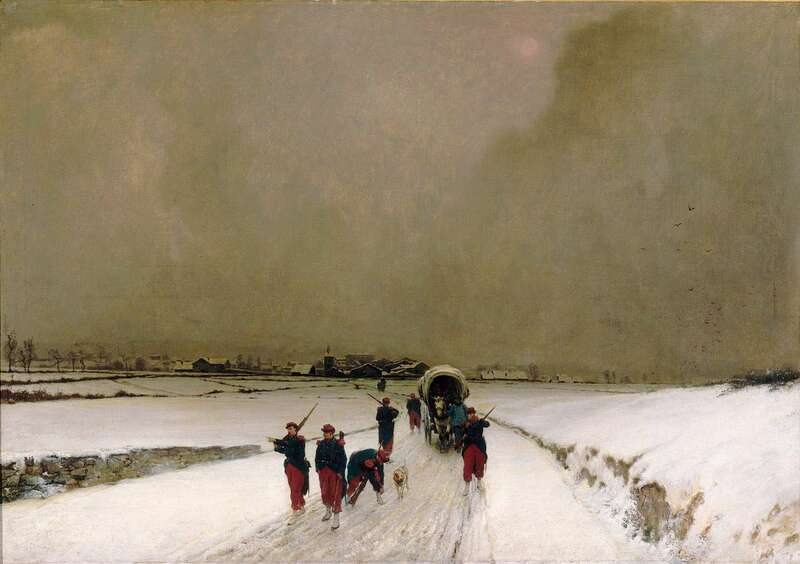 Augustin Pierre Bienvenu Chenu (Fleury Chenu) (1833-1875), Trainees, Snow Effect (1870), oil on canvas, 170 × 152.5 cm, Musée d’Orsay, Paris. Wikimedia Commons. Fleury Chenu’s father in Briançon, France, was a master tailor working for the French Sixth Regiment at the time. Chenu’s Trainees, Snow Effect from 1870 gives a good idea of the very limited preparation which the French had made as tensions mounted during the previous winter. Although a detailed realist painting, Chenu’s sky is so powerful, and sets the scene for the straggling trainees as they make their way along the icy road. Pierre-Georges Jeanniot (1848–1934), Reservists (1870), further details not known. Wikimedia Commons. Pierre-Georges Jeanniot had become an officer in the French infantry in 1866, and at the time of the war was a Lieutenant in the 23rd Infantry. 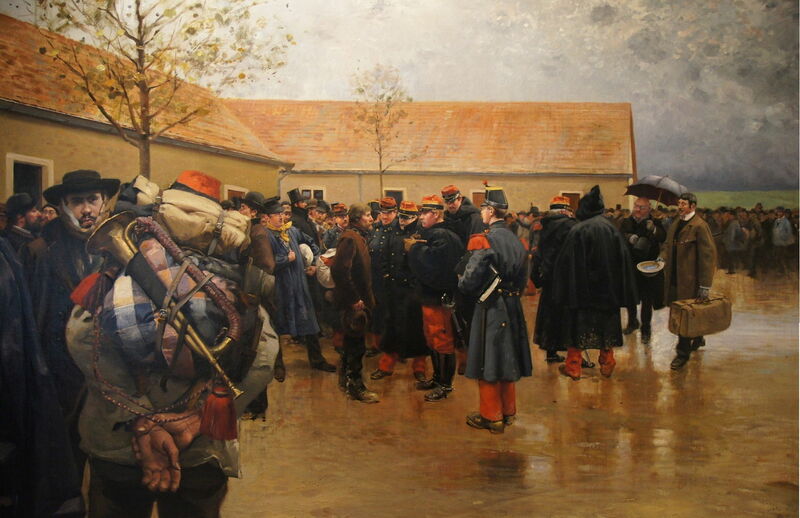 He must have known how numerically inferior and weak the French forces were when he painted these Reservists (1870) queueing in the heavy showers to enlist and serve their country. The French mobilisation occurred before reforms had been implemented to the system, and proved chaotic and inadequate. Jeanniot was wounded at Rezonville, was awarded the Légion d’Honneur for his service during the war, and eventually left the army in the rank of Major. Adolph von Menzel (1815–1905), Departure to the Army of King William I, 31 July 1870 (1871), oil on canvas, 63 x 78 cm, Alte Nationalgalerie, Berlin, Germany. Wikimedia Commons. Napoleon III left Paris for the new headquarters in Metz, as commander of the Army of the Rhine, on 28 July 1870. Although the Prussian army had its own professional General Staff under the command of Field Marshal von Moltke, Adolph von Menzel here shows the ceremonial Departure to the Army of King William I, 31 July 1870 (1871). That same day, Napoleon’s forces moved towards the Saar River to pre-emptively seize the Prussian town of Saarbrücken. 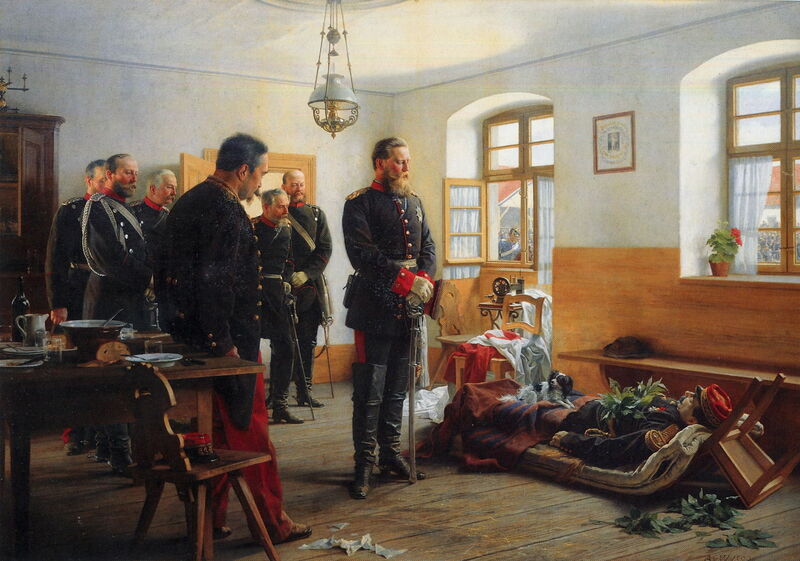 Anton von Werner (1843–1915), Crown Prince Friedrich Wilhelm with the Body of General Abel Douay, Weißenburg, 4 August 1870 (1888), media and dimensions not known, Germanisches Nationalmuseum, Nuremberg, Germany. Wikimedia Commons. Anton von Werner had been sent with the staff of the Prussian Third Corps under the command of Crown Prince Friedrich Wilhelm of Prussia. When French and Prussian forces fought their first substantial action on 4 August, in the Battle of Wissembourg, the French were soundly defeated and forced to retreat. The commander of the French I Corps was killed, and von Werner committed that to canvas in 1888 as Crown Prince Friedrich Wilhelm with the Body of General Abel Douay, Weißenburg, 4 August 1870. This was the first of a series of major defeats for the French during August. Alphonse-Marie-Adolphe de Neuville (1836–1885), The Last Cartridges (1873), oil on canvas, 109 x 165 cm, Musée d’Orsay, Paris. Wikimedia Commons. Alphonse-Marie-Adolphe de Neuville made his reputation with a succession of very popular paintings showing the war. 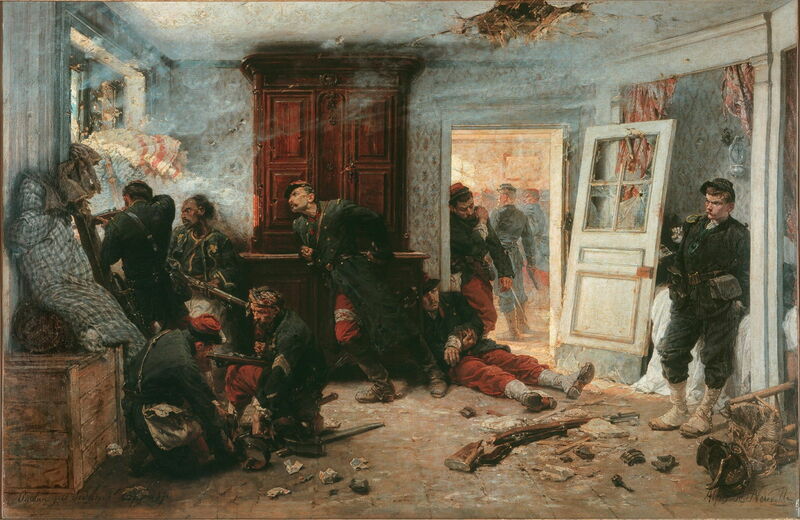 The Last Cartridges (1873) shows French snipers from the Blue division of the Marines ambushing Bavarian troops in l’Auberge Bourgerie in Bazeilles just prior to the Battle of Sedan, in which the French suffered their most disastrous defeat to date: on 2 September 1870, Napoleon III himself was forced to surrender with 104,000 of his soldiers. Alphonse-Marie-Adolphe de Neuville (1836–1885), The Spy (1880), oil on canvas, 130.2 x 213.4 cm, Metropolitan Museum of Art, New York, NY. Wikimedia Commons. 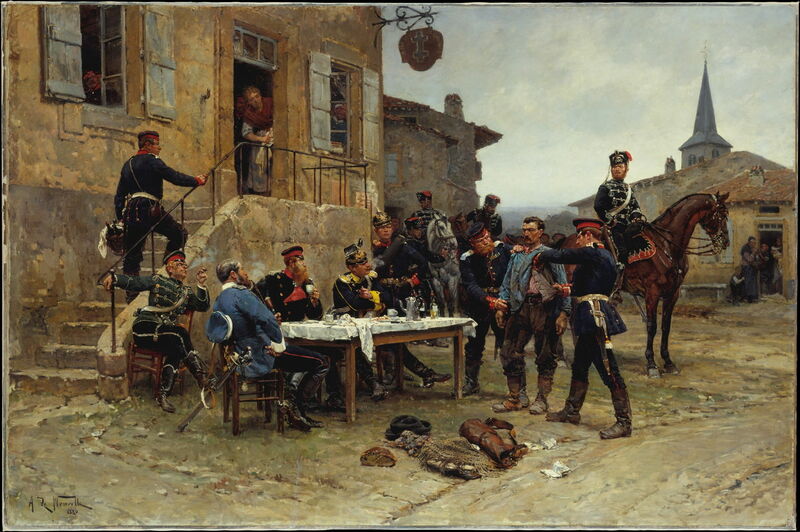 De Neuville’s The Spy from 1880 shows a scene exploiting the humiliation of the French defeat. As Prussian forces advanced through northern France, they captured and shot good French citizens who they considered had got in their way. The Frenchman in blue to the right of centre is being searched and stripped in front of a group of Prussian officers, clearly accused of trying to defend his own country. Paintings like this fuelled Revanchism, the lasting sense of bitterness and demand for revenge against Prussia – and were disturbingly popular. Alphonse-Marie-Adolphe de Neuville (1836–1885), In the Trenches (1874), oil on canvas, 57.7 x 96.5 cm, Walters Art Museum, Baltimore, MD. Wikimedia Commons. 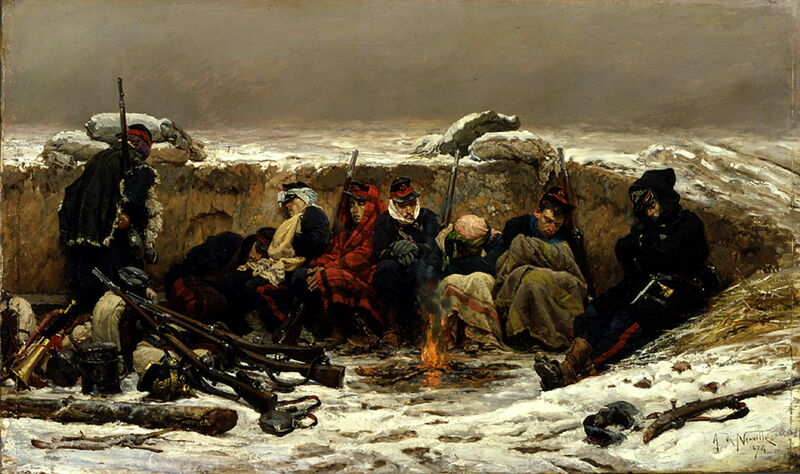 De Neuville’s In the Trenches (1874) is perhaps a more faithful depiction of the conditions which French soldiers had to endure as the Prussians took more French territory during the early winter. Members of the Garde Mobile take what shelter they can in the bitter cold. Paul-Émile Boutigny (1853–1929), Scene from the Franco-Prussian War (date not known), oil on canvas, 49 x 60 cm, location not known. Wikimedia Commons. 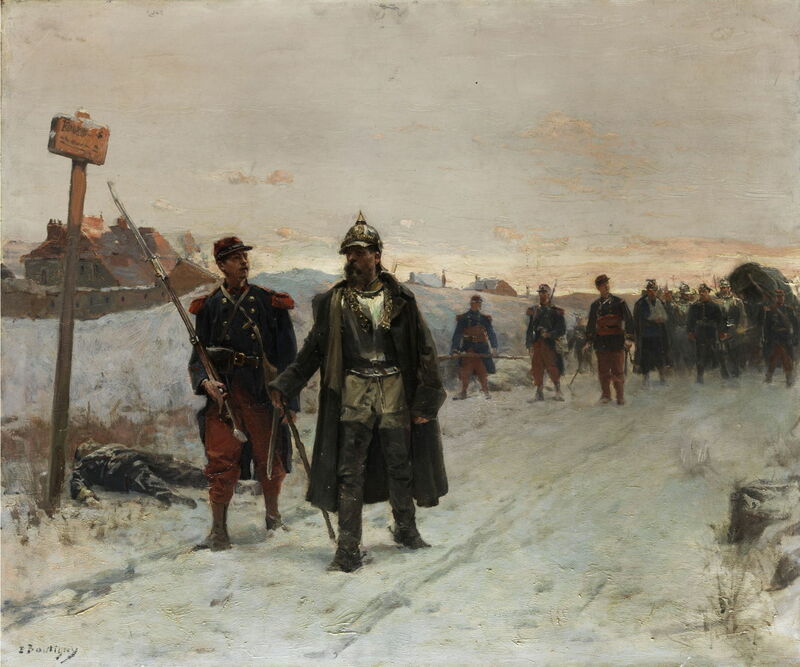 Paul-Émile Boutigny’s undated Scene from the Franco-Prussian War shows that life was no easier for the better-trained and properly-equipped Prussian forces as the fighting moved into the winter. The two soldiers in the foreground make a fascinating contrast: the officer on the left is wearing modern battle clothing and holding a Dreyse needle-gun, a breech-loading rifle; his colleague on the right wears what is essentially modernised armour with a ‘pickelhaube’ spiked helmet. Émile Betsellère (1847–1880), L’Oublié! (Forgotten) (1872), oil on canvas, dimensions not known, Musée Bonnat-Helleu, Bayonne, France. Wikimedia Commons. Émile Betsellère’s moving L’Oublié! (Forgotten) from 1872 shows the appalling conditions facing the wounded after a winter battle. Albert Anker (1831–1910), Bourbakis (1871), media not known, 95 x 151 cm, Musée d’art et d’histoires, Neuchâtel, Switzerland. Wikimedia Commons. Albert Anker was a Swiss artist who you would not have expected to have painted scenes from the Franco-Prussian War. However, in January 1871, he was witness to a strange event which must have affected him deeply. The French General Charles Bourbaki (1816-1897) had been put in command of the Army of the East, soldiers who had been hastily trained and were ill-equipped. He and his troops were defeated in their attempt to raise the siege of Belfort, and were pursued by the Prussians until they crossed the border into Switzerland in late January and early February. Just over half of his 150,000 men had survived, and were in desperate straits by this time, as the winter conditions worsened. 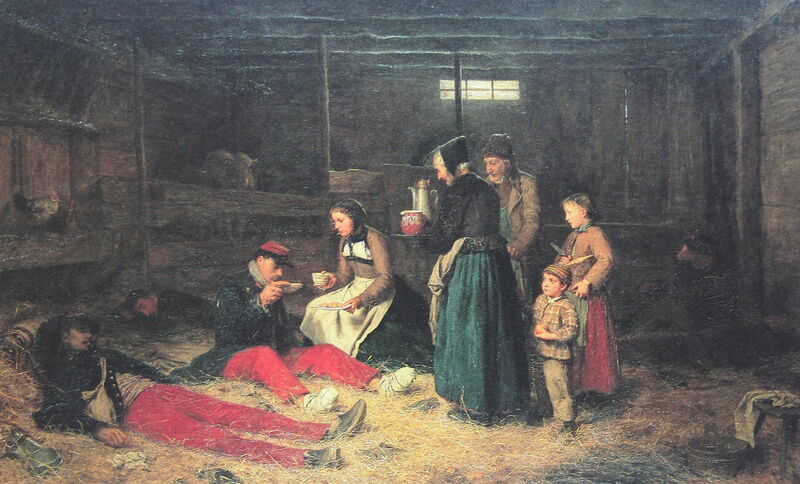 The Swiss disarmed them, gave them as much shelter and aid as they could, as shown in Anker’s painting of Bourbakis from 1871, and returned them to France in March. Most important of all, though, was the fact that on 19 September 1870, Prussian forces had taken control of the country around Paris, and put the capital under siege. Posted in General, Life, Painting and tagged Anker, Betsellère, Boutigny, Chenu, de Neuville, Jeanniot, narrative, painting, realism, von Menzel, von Werner, war, war artist. Bookmark the permalink. A fascinating and very detailed account! No I haven’t: it looks amazing! The link to its site is here. Thanks, Alberic – all I need now is an excuse to go to Lucerne, and the time.